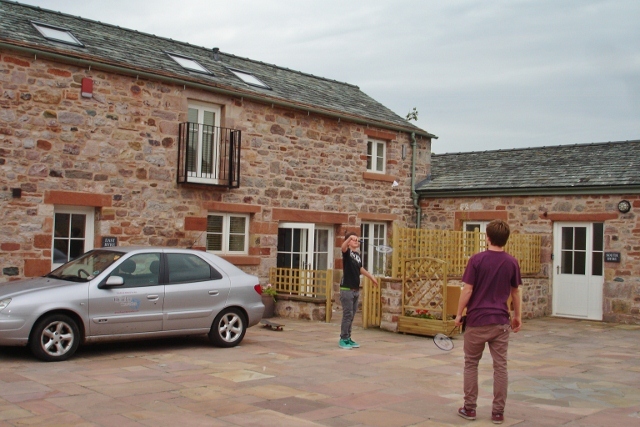 My son, his mate and I were having a short weekend break at the Salutation Yard, a new complex of tastefully done-out self-catering cottages in the little village of Skelton, Cumbria. This charming area is far less well-known than the Lake District and is on the edge of the Eden Valley to the west of Penrith. It’s a perfect escape from usual tourist hot-spots in the region and has a tranquility that is most beguiling. Rather quirkily, East Byre, the largest of the 3 cottages, used to be a cow byre and hayloft and some original features still survive. We had a choice of 3 bedrooms and 3 bathrooms; needless to say Mum got the biggest one! The kitchen has a fab cooker and is incredibly well-stocked. There was a welcome pack of goodies including a box of chocolates & a bottle of wine -and the bread mix of course. My son wanted to know why our home wasn’t like this and could we have a big flat screen TV please? There’s plenty to do nearby though you do need a car for most of the sights. We drove to the pretty little village of Greystoke with its Castle famous for its links to the Tarzan story. After stocking up with a few more provisions in the local newsagent’s, we had a wander round. I love these old Cumbrian villages with their quaint houses, old pubs and lichen-covered walls. We saw a very quirky sight on the green – a scarecrow sitting on a rusty old bike complete with helmet. 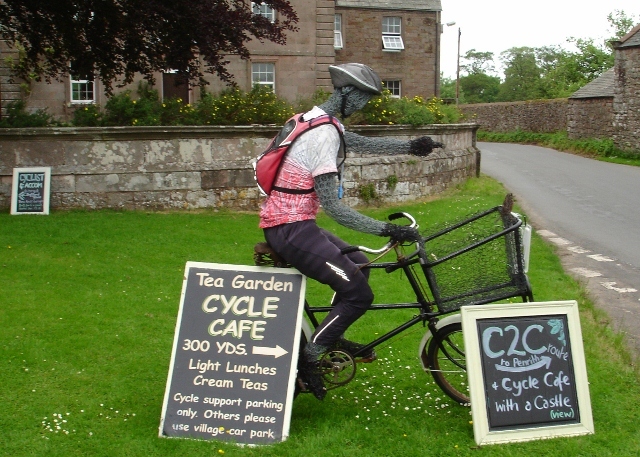 The village is on the Coast to Coast Cycle Route and the Greystoke Cycle Cafe caters for cyclists and travellers in a delightfully quirky old farmhouse. We had a drink in the garden overlooking the castle, some willow-weave hens and some very tired cyclists. The boys had a go at making the bread and then, after dinner, (pizza, salad and cake – no culinary effort for any of us on holiday!) we found a big box of games for us to play with – Monopoly brought back memories from long ago. The smell of baking bread wafted around the comfy lounge as we watched TV. Then it was bedtime and those superduper bathrooms and lovely big beds. It’s a while since I’ve woken up to the sound of church bells on a Sunday and the calling of the swifts – or were they Swallows … or maybe Amazons. 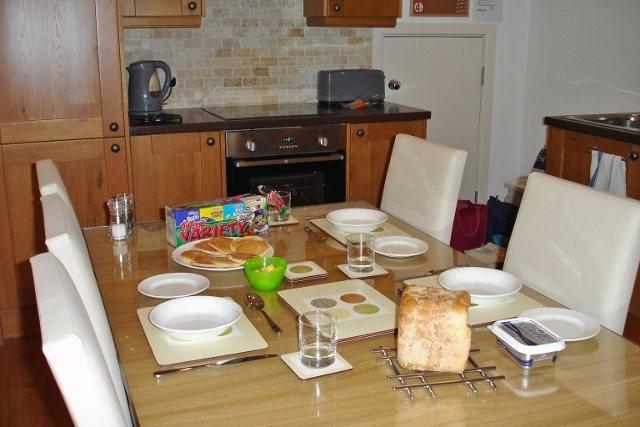 We had a lazy morning with their excellent homemade bread, pancakes and cereals. I’d got a day’s outings planned – a visit to Hutton in the Forest, an ancient house in large grounds nearby, then on to High Head Sculpture Park BUT … the boys said they just wanted to stay at the cottage, have another wander round the village and play badminton. So … that’s what we did. After the walk I read a book whilst they played in the yard until mid-afternoon when it was time to return to reality. 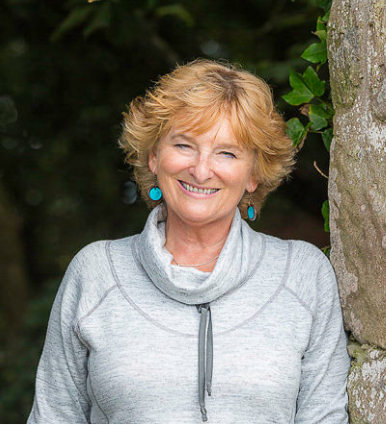 Jane & Duncan Hodkinson own Salutation Yard, part of Sojourn North self-catering accommodation and have combined their love of restoring properties with wonderful hospitality and the ability to create comfortably luxurious places to stay. Quirky touches are found in all their properties – in Easy Byre my son thought the sea view paintings were ‘cool’ and I fell for the pottery ducks. Many thanks for them for a lovely break – highly recommended for a true get-away the Cumbria countryside. Looks and sounds like a great weekend. Just the place for a retreat. It certainly is Barry 🙂 And the area is a real hidden gem … you’d love it! You can find out more about the creators of the art in the holiday homes by visiting http://www.sojournnorth.co.uk and clicking Eden Valley-Salutation Yard-features-original art. You have hit the nail on the head! Duncan and Jane certainly know how to look after your every need well! 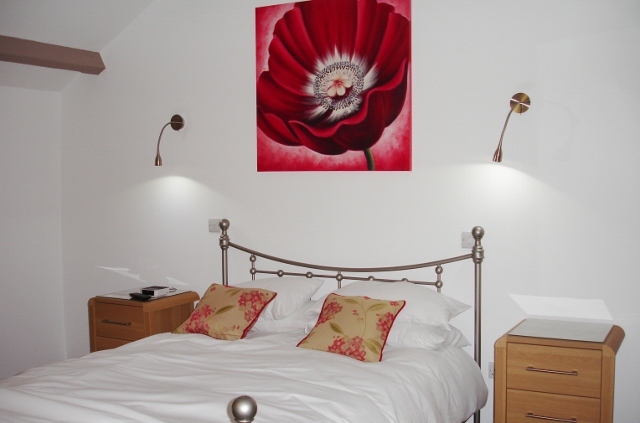 They have done a lovely job restoring these old historic buildings into beautiful comfortable places to stay! I don’t think anyone would be disappointed with their stay here! A really wonderful place to stay, the cottages are amazing, would definatly recomend! Duncan and Jane are such wonderful hosts and I can highly recommend the cottages. Jane’s eye for interiors is so tasteful and creates a modern relaxing atmosphere. As one of the exhibiting artists I’m thrilled to have such a glowing review too! A beautiful part of the world to stay in such beautiful accommodation! What a fabulous shot of the two teenagers making bread! That’s the first time I have heard of a cottage supplying a bread making machine – and what a thoughtful idea to leave the bread mix! It must have been a wonderfully relaxing weekend – the fact that two teenage boys were content to mooch around the cottage/village rather than be bored and demanding attention speaks volumes…. wait to go again! Thank you. Fabulous luxury accommodation with such thoughtful design and attention to detail…appealing for all the family.You can combine relaxation,peace and tranquility with outdoor fun and activity in the beautiful Cumbrian surroundings.Just the place you would want to return to. 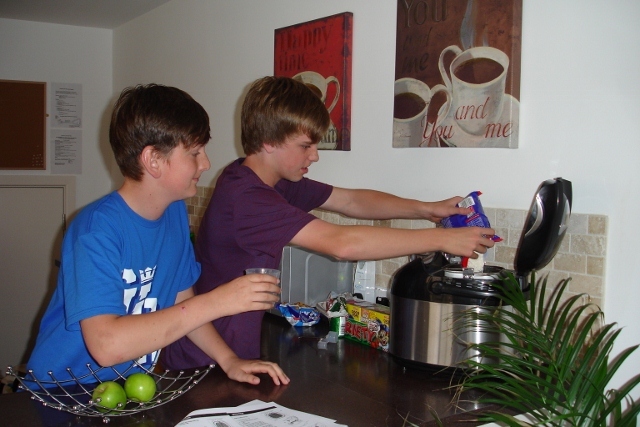 It’s wonderful having the teenage boys lend a helping hand. I don’t recall being a wiz in the kitchen at their age. This place looks really cozy – a perfect retreat. Many thanks to everyone who’s left comments. We had such a fun weekend and it’s great to look back on that time when the boys were young – they are now both over 6′ tall and not quite so keen to go away with Mum! Beech Hill Hotel on Lake Windermere – the epitome of quirky!